The priorities set by First Nations need to be front and centre on the national stage. “I wouldn’t as a national chief let the federal government over run priorities that are set by our people,” said Manitoba Keewatinowi Okimakanak Grand Chief Sheila North, who is challenging three others and incumbent Perry Bellegarde for the position of national chief for the Assembly of First Nations. “Right now we’re seeing a movement of … vibrant sovereign voices. I think the national chief at this time would do very well if they listened to those sovereign voices,” said North. “The innovative and good ideas are coming from our communities, not from government or individuals. It would be wise for the next national chief to bring out and enhance the voices that are coming from our nations,” she added. North said she was asked by some “well-respected” chiefs to seek the position because they were impressed by how she communicated and conducted herself in her present role. Before going into politics, North was an award-winning journalist for CBC News and CTV. “It’s part of my responsibility as a good citizen to do what I can for my community at this time,” she said. 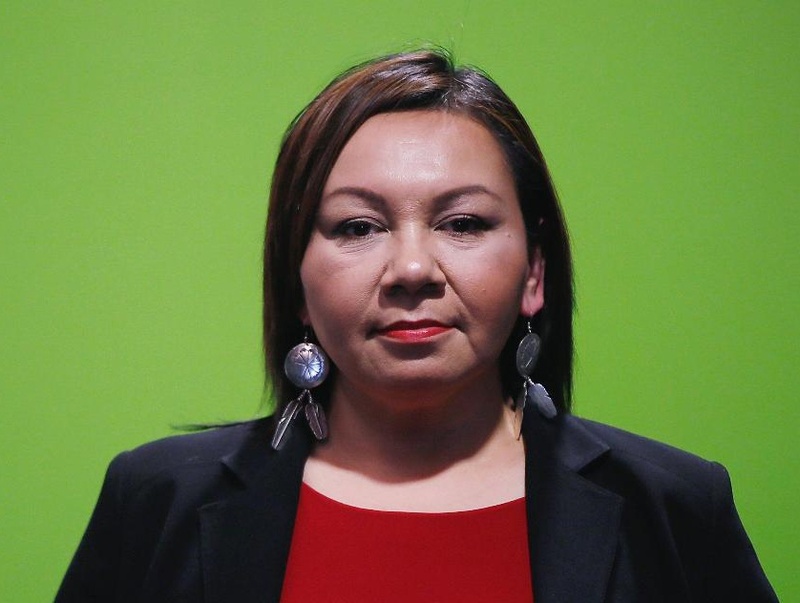 North is one of two women in the running to head the national Indigenous organization. Presently, the AFN executive includes three women regional chiefs: Marlene Poitras (Alberta), Kluane Adamek (Yukon) and RoseAnne Archibald (Ontario). But being a woman is not something North will be focusing on during her campaign, although she admits that many First Nations and Indigenous communities used to be matriarchal societies. “To me a leader is a leader. That’s what my father taught me and that’s how I want to look at it because I think we’re all called to a different purpose in life at a certain time. We all have goals and gifts and abilities,” she said. Strong communication skills are something North prides herself in. She says she listens to “even the quiet ones”; she provides forums for people and groups to talk; she makes a “strong attempt” to be inclusive; and she works to find the commonalities between people, communities and governments. Bellegarde may be presenting these different points of view and he may be having those difficult discussions with the federal government, but if he is, says North, he hasn’t made it clear. “Maybe that’s a communication problem and that’s where I’m good at, communication. Maybe there’s the perception that they’re too cozy, but maybe at the same time they’re actually pushing. But we don’t know. We haven’t seen that yet. We haven’t seen that combination,” she said. North doesn’t believe that movement from the federal government is due to work undertaken by Bellegarde. “He’s been at the right place at the right time. I can’t really credit him for a lot of the things the government has done, because that’s what the government has done,” she said. And while there’s a marked difference in attitude between Harper’s Conservatives and Trudeau’s Liberals, North accuses Trudeau of “offering a little bit of hope here or there that they’re going to do the right thing” but never fully delivering. That’s evident from the lack of changes “on the ground in our communities.” She says neither the Liberals nor Bellegarde should be celebrating as boil water advisories are lifted one or two at a time, since safe drinking water is a basic human right. North says the Canadian government must honour treaties and Aboriginal titles, which will go a long way in advancing Trudeau’s claim that Canada’s relationship with its Indigenous peoples is the most important. She contends that the new rights recognition implementation framework proposed by Trudeau will serve to hold First Nations back. North wants to see opportunities created for First Nations that focus on building economic independence and strong economies. To that end, she says she was disappointed that Bellegarde missed an opportunity to meet with Ottawa to discuss taxation advantages for First Nation involvement in the cannabis industry. North also emphasizes the need for strong language and culture. She wants an overhaul of the child welfare, healthcare and justice systems. But not only does the relationship with the federal government need transformation, so does the structure of the AFN, says North, stressing those changes will be guided by the grassroots, although that will take time. “I think it’s very necessary to start looking at how we can make this organization more of what our chiefs are needing and wanting it to be which is a partner and not the one who speaks and makes decisions on their behalf on such big issues,” she said. She is a member of the Bunibonibee Cree Nation.